We unveil the top 10 fastest and slowest locations to sell a home in 2018. Northampton, Coventry and Manchester are the locations where homes are selling quickest, according to our analysis tracking the speed of the property market. The three towns lie in postcode areas where sales are typically agreed in less than 36 days – three times faster than some parts of London. 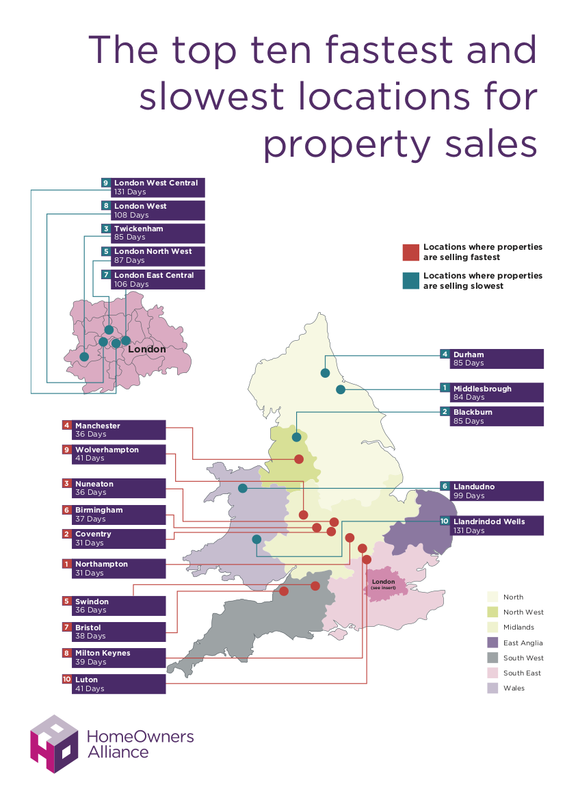 The research is based on searches conducted during December 2017 using the EstateAgent4ME tool here on the HomeOwners Alliance website. The analysis looked at how long thousands of houses and flats were listed on a property website before being marked as “under offer”. Seven of the 10 postcode areas where homes are changing hands most quickly are in the Midlands. These hotspots include Birmingham, Milton Keynes, Wolverhampton, Luton and Stevenage. The analysis provides further evidence of a slowdown in the London property market, with four of the 10 postcodes areas with the slowest sales either in or close to the capital. Three others in this slower group are in the North East: Durham, Middlesbrough and Sunderland. Properties around West London are on average taking almost 108 days to go under offer – slower than any other postcode area. 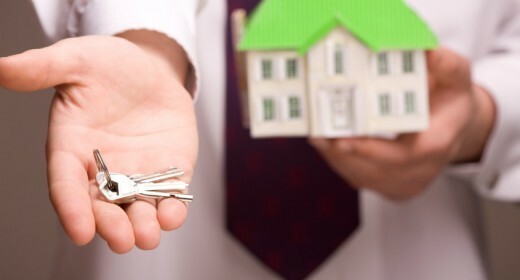 “Knowing how long a sale can take is vital intelligence for anyone trying to sell their home. Our EA4ME tool gives homeowners a greater understanding of their local market and provides new insights into the state of the national picture. On a practical level, if selling your home fast is a priority, it means you can find, compare and rank your local estate agents according to ow quickly they sell a house like yours. Postcode areas with fewer than 50 searches have been excluded from these tables. This Homeowners Alliance research looks at how many days properties on average take before being marked as “under off”. As well as producing a national average figure of 60 days, we have broken down the data by more than 100 postcode areas in England and Wales. We track the details of when homes are posted on all major property listing websites. The postcode area relates to the address of the estate agent advertising the property. We have therefore omitted transactions from online only estate agents in this research – which can have only one office. We determine how long a sale takes by calculating each agents’ average time to reach a sale subject to contract for all properties advertised by this agent on websites during the previous 180 days. 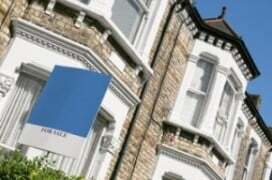 Although not every property for sale is listed online, our samples are large. The data in this release was based on nearly 18,000 search results generated by the EstateAgent4Me service in December 2017. Although all the searches were conducted during that month, these searches will include some agents’ performance data that may stretch back to June 2017. Our research does not extend to Scotland or North Ireland. Our tables have excluded three postcode areas with fewer than 50 searches. These are: Llandindod Wells (LL), London East Central (EC) and London West Central (WC). Their average success rate (how likely they are to sell a home) – this is determined by the percentage of all properties found advertised by this agent on websites during the last 180 days that were subsequently advertised as sold subject to contract. Whether they achieve the asking price – this is calculated by dividing the sold price (as recorded at HM Land Registry) by the initial advertised asking price averaged for a representative sample of properties found advertised by this agent on websites during the previous 180 days. How long, on average, it takes them to sell a property – this is determined by calculating each agent’s average time to reach sold subject to contract for all properties advertised by this agent on websites during the previous 180 days. Nice Post! thanks for sharing very useful Info appreciate it thanks this is worth sharing ..